Our experienced siding professionals install a wide variety of materials, giving you the perfect choice for your home. 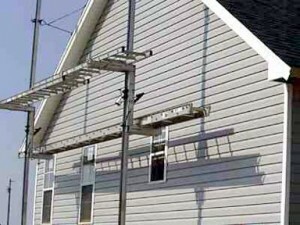 Installing home siding on your residence is a huge and sometimes a complicated decision. There are many choices out there; cedar siding, vinyl siding, stucco, and more when looking into home siding cost. What color of the siding you will go with needs to taken into consideration too. If you go with a wood siding the natural wood colors can be considered. Or will you chose a bright vibrant color with a neutral base? GF Sprague will help you make the right decisions for your home for siding installation. Call us today at 1-781-209-6791 or click below to learn more about how we can help you. We offer free estimates on all our work in Newton, Needham, Wellesley and the nearby areas. New siding is one of the best ways to improve curb appeal and property value. At GF Sprague, we offer multiple siding materials including traditional and maintenance-free solutions that will increase the beauty and value of your home. Cedar Siding: Cedar siding has a traditional look and feel. It can last 30 years or more if it is maintained regularly. It will need to be painted regularly to keep water away from it. Don't let the gutter drip at the base of the house or splash up the siding, and remember to aim water sprinklers away from it. It can be done as board, vertical clapboards, horizontal clapboards, shingles, etc. Spruce and pine are also used in a cabin style construction. Unlike cedar, pine is not rot resistant. Vinyl Siding: Vinyl siding is easier to maintain then cedar, particularly when it comes to bug infestation. There is little if no splitting, cracking or peeling with vinyl siding. When it comes to home siding cost, vinyl is cheaper and remains the number one siding in the United States and Canada. Stucco Siding: Stucco siding is versatile, durable and very strong. When taken care of properly it can last for decades. Stucco can be painted or dyed any color. It is one of the main sidings in areas that suffer earth quakes, as it is easy to repair. It needs to be hosed off once in a while, however a crack may need to be repaired one in a while. It is more durable and efficient than the other types of siding. After researching the types of siding, there is still the decision of the color. It is a good idea to remember the fade ratio when choosing the color. If a vibrant color like barn red is chosen, it is good to know that it will fade faster than a neutral color. GF Sprague provides our professional siding services in Needham, Newton, Wellesley, Chestnut Hill, Weston, Boston, Brookline, Quincy, Watertown, Cambridge and surrounding areas.